If you are not subscribed to the News page of Languages NSW, you may be missing out on important news for languages teachers. As we no longer have language-specific consultants, most content is posted on the News page. This includes information for professional learning, state-wide webinars and NESA updates. To ensure you are subscribed to our News page; simply add your email address to the RSS feed box on the side-bar (highlighted in yellow below). You will receive an email when Languages NSW News page has been updated. The new course prescriptions 2019-2023 for the Stage 6 Korean and Literature course are now available. We've noticed that many subscribers to our Korean page are missing out on important news for languages teachers. Important information, for example, about our professional learning, state-wide updates, NESA news and collaboration with teachers, is normally posted on the News page, and not on the language-specific pages. Please ensure you are subscribed to our News page by adding your email to our RSS feed on the side-bar (highlighted in yellow below). ​This means your will receive a daily email message when Languages NSW News has new content. You can receive similar updates for the Korean language page by following the same step on this page. Diploma of Language Studies in 2015. Languages offered are: Indonesian, Spanish, Korean and Japanese. For more information see the Diploma of Languages webpage. ‘K-Pop Dance Contest in Sydney’ is annually organized by the Korean Cultural Office, Australia for K-Pop lovers to be in the spotlight! Anyone who is enthusiastic about K-Pop and has a gifted talent should never miss this opportunity. This is an opportunity to express your cravings for K-Pop. *It’s free admission and the tickets will be distributed 1.5hours prior to the contest start on 23rd August at the UNSW Science Theatre. Entry will be permitted 30 minutes prior to the contest and only those who have the tickets will be allowed to enter the contest. 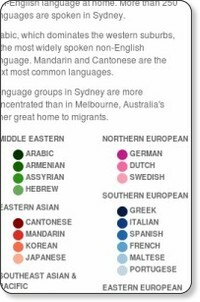 Sydney Morning Herald Datapoint interactive shows that nearly 40 per cent of Sydneysiders speak a non-English language at home. More than 250 languages are spoken in Sydney. Arabic, which dominates the western suburbs, is the most widely spoken non-English language. Mandarin and Cantonese, found predominately in the north shore, are the next most common languages. Korean traditional fan dance presented by Eastwood PS students at the Opening of the AEF National Conference 2014. It was a brilliant fusion dance performance - traditional fan dance in contemporary K-pop. Well done, Jiwon ssn and her wonderful students! Now more photos are available from the AEF conference photo gallery. Many thanks to Fiona for kindly forwarding the newsletter and news link about ANZAC Day. An article came out in Macathur Chronicle and the Daily Telegraph. Follow this link to watch their 'ANZAC Day' video clip. "The part of the program was filmed at St Andrews Public School about our ANZAC Day service. The program has English/Korean subtitles. The whole program may be of interest for your background knowledge about the Korean War and the Korean War Veterans who visit our school. It discusses how Australia remembers War Veterans including how Australia remembers Indigenous War Veterans. It is resource that is multimodal and covers both Cross-curriculum priorities Aboriginal and Torres Straight Islander histories and cultures and Asia and Australia's engagement with Asia." Thank you, Fiona for sending this link with the comprehensive information! This Video resource might be of great use for Korean courses at the secondary level.